Europe's largest dry ski slope has completed a major refit, two years after it was threatened with closure. The Midlothian Snowsports Centre at Hillend opened a new slope extension earlier. It follows £600,000 of improvements to bring it up to world class standard. There is an extra 200m of slope, a longer nursery section and new lifts. The centre had been at risk of shutting after Midlothian Council said it could no longer afford to fund it. Sportscotland, the national agency for sport, and the Scottish government stepped in with £1m of funding to secure the site's future. 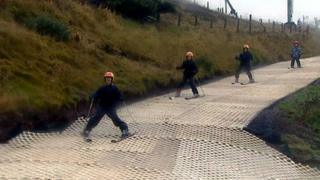 Sportscotland said it hoped the upgrade would encourage more people onto the slopes and inspire future generations.